after a heavy dinner and even heavier stomachs, this morning called for a light breakfast. i opted for a simple mix of yogurt, fruits and some muesli. and then, i popped up my routine question to my husband "what will you have for breakfast?". now i still don't know if it is my husband's liking towards vague statements or if he simply wants to play the options game with me always, he answered "i will have something light" (wow that was helpful i thought *eyes rolling*). i asked him "cornflakes? "(option 1) and no came the reply. then sticking to the safe bet i asked " so eggs and toast? "(option2) and after him giving it a pensive thought my anticipation came to an end with his yes(sigh of relief!). so "omlette and toast" it was for him. now not everyone knows that once upon a time i was awfully bad at making an omlette. i used to get mom-made perfect omlettes till i went to cardiff for postgraduation. students obviously does not have enough time and luxury to make paranthas(flatbread) and poha(rice flakes) for breakfast (we used to make paranthas maybe twice a month for dinner, that too on the condition that it will be a group effort). sandwiches and cereals come to their rescue when it comes to preparing the first meal of the day. so one morning in cardiff i tried boiling eggs and i was wondering how will i ever know that they are boiled and i am supposed to take them out(now i know that they are done when they start floating). i screwed up my breakfast that morning. the next morning was brighter with a simple half fry (one of the two types of eggs i could manage another one being scrambled eggs). with hope in my heart one day i started working on an omlette and to my dismay it got stuck to a non-stick pan and ended up being a bhurji(scrambled eggs). 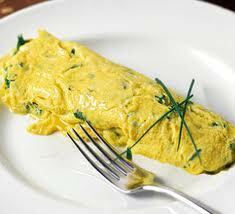 but i did not give up and kept trying to get the perfect omlette ending up with bhurji everytime. when i got married, i realised that my husband makes just the perfect omlette (he made one for me for breakfast the first sunday morning after marriage. alright, i know the girls will go "awww, how sweet", even i did :p). i felt if he can make create such a food art for me i should also put in some effort. and then one morning, with full determination i took out two eggs basking in their glory, sitting in the fridge. i broke them and poured them into a glass, whisked them, added the beautiful red onions and the hot green chillies, a pinch of salt and paprika. then came my secret ingredient- a few drops of milk falling into the tall glass. while the pan was getting hot i gave it all a final whisk. i poured the eggs into the oiled pan. the mixture came to life with bubbles bobbing all over. i flipped it and then covered the pan with a plate. after a minute of trepidation, wondering if i will get it right, i picked the plate up and the fluffy omlette brushed a huge smile on my face. 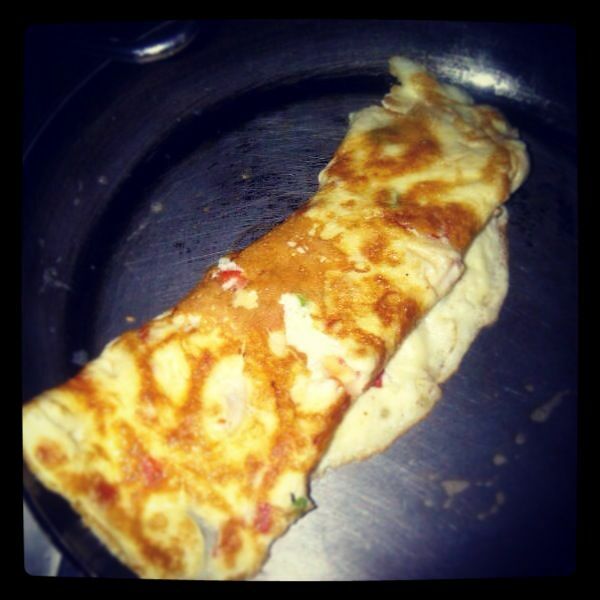 now i don't know if i should give the credit to the pan or believe its love but that is how i got my perfect omlette. since then i have been making one for my husband. coming back to this morning, i served the perfect omlette sprinkled with black pepper, some buttered toast and sauce in a plate, just the way my husband likes it and tapped my back for the good work :D.